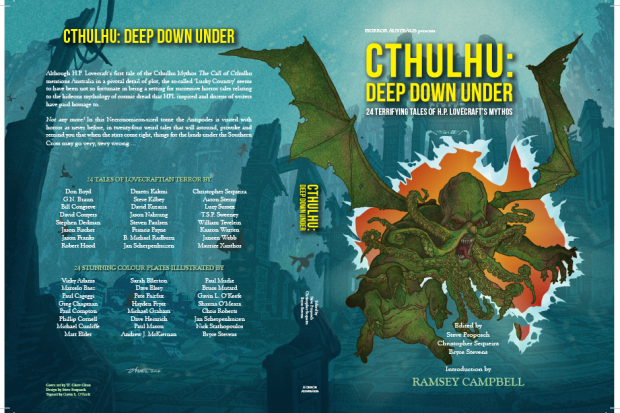 I’ll be at Armageddon Melbourne this Saturday & Sunday (18/19 Oct) for the crowdfunding launch of Cthulhu: Deep Down-Under, featuring my Lovecraftian-action novella ‘Vanguard’. We have Booth 74 (author roster still to be determined), but will all be on the Comic/ Animation Stage at 4pm Sat for the official launch. If you’re at Armageddon please come along and support us. We’ll be selling signed prints of the great art from the collection (*very* cheap, so first-in, first-served). And I’ll even be bringing some rare Wolf Creek 2 postcards to hand out. C:DDU is edited by the formidable trio of Christopher Sequeira, Steve Proposch and Bryce Stevens, and features not only works by Kaaron Warren, Stephen Dedman, Geoff Brown, Steven Paulsen, Jason Fischer, Janeen Webb, Robert Hood and Jason Franks, and art by Sarah Ellerton, Nick Stathopoulos and Jan Scherpenhuizen, but also an introduction from the inimitable Ramsey Campbell on antipodean horror. This is a huge and ambitious undertaking, and marks quite a leap for Lovecraftian horror in Australia. Very proud to be associated with it. If you can’t get there (or live O/S) never fear for the crowdfunding site is now live! 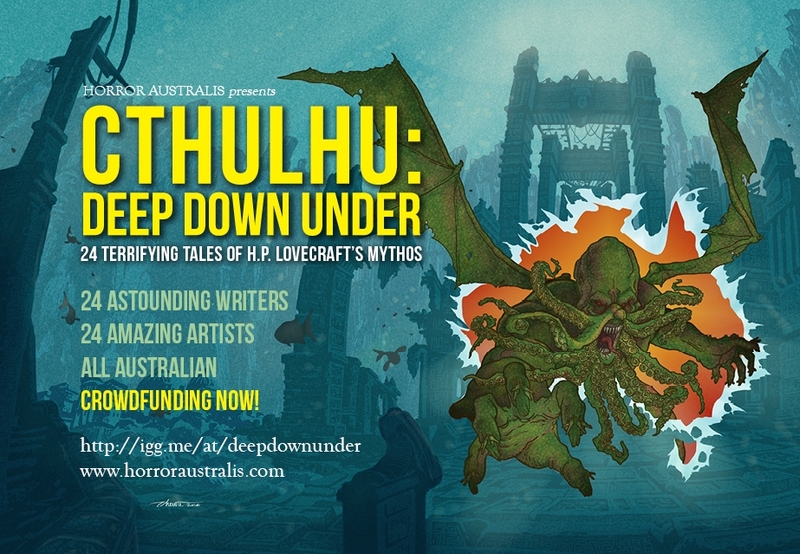 Check out https://www.indiegogo.com/projects/cthulhu-deep-down-under for the great offers.